Group training is available for children during the school day, after school or school holiday, we can design a course according to your needs and requirements. We can even add in a puncture repair or basic bike maintainence session! Our school holiday programs can be 1, 2 or 3 days long and will enable Grade 3-6 children to build confidence, skills and awareness on their bike. The course will aim to teach a range of skills including preparation for riding, riding safely, safety checks, emergency stopping, using gears, scanning, signalling and riding on different surfaces as well as the footpath. It can also include road rules & signs and basic maintenance. The skills are taught through instruction, demonstration, practice, games and challenges. 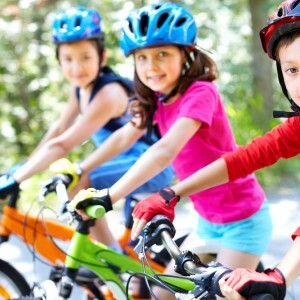 If your school isn’t running Bike Ed we can do it for you! Our in or after-school cycle training sessions for students are designed with many, many hours of experience of teaching children riding. The program incorporates a combination of Bikeability training from the UK, Bike Ed and AustCycle skills and will be tailored to your needs and budget. The course will teach a range of skills including preparation for riding, riding safely, safety checks, emergency stopping, using gears, scanning, signalling and riding on different surfaces as well as the footpath. It can also include road rules & signs and options for on-road training. The skills are taught through instruction, demonstration, practice, games and challenges.